Printed on a white 100% cotton t-shirt. New design created from a vintage cigarette ad. 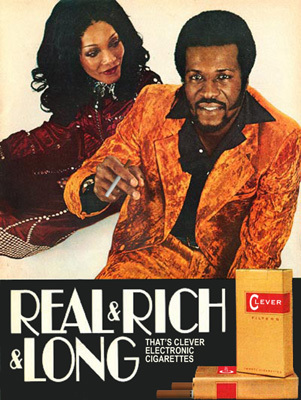 A stylish man holding an electronic cigarette is being admired by a beautiful woman. It says "Real & Rich & Long. That's Clever Electronic Cigarettes."